Raising money for the mission of the Church is about to get a whole lot easier. Virtual Reality has the unique ability to totally immerse prospective donors in an electronic environment that some herald as an “empathy machine”. For, instead of being a passive listener while the pastor asks for money to cover the expenses of running a parish, or instead of being a passive viewer of a traditional 2d film about the people who will be helped by a fundraiser, the virtual reality user becomes an active director in a 360 degree environment, witnessing what seems very real, which triggers empathy, which triggers good stewardship and involvement. Potential donors can watch the VR film from the comfort of their own home but feel what it’s like to be present in a poor country, in a homeless environment, or a medically challenged war scenario. And with the new IHS (Information Handling Services) Market Report predicting that Virtual Reality headset distribution will reach 81 million by 2020, the opportunities for the Church to raise more money using VR will soon grow larger. Ever since Facebook paid 2 billion dollars for Oculus back in 2014, there’s been a sort of gold rush towards developing the Virtual Reality industry. All sorts of money is being thrown into the industry. Taiwan-based HTC Vive created a VR accelerator with some 10 billion in “deployable capital”. Playstation just launched a VR system that’s compatible with its install base of some 40 million game sets already in homes. And “Raw Data” is reportedly the first VR game to reach sales of 1 million per month. Needless to say, the hype around VR is at a high as many forecast it to be the next great computer platform after the smart phone. But how can the Church monetize this new technology? By looking at how the charity industry is monetizing its VR fundraising efforts. In collaboration with the virtual reality production company Vrse.works, Charity Water made a VR film contrasting the before and after effects of Charity Water outreach. 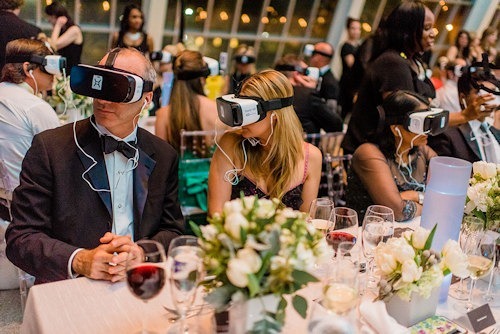 At a black tie event at the Metropolitan Museum of Art in New York last December (2015), some 400 donors were shown the film on a Samsung Gear headset (see photo above). The results were astonishing. AdWeek.com reported that the earnings from donors totaled $2.4 million for the night, much higher than expected. One donor initially committed to giving $60,000, but after seeing the film, decided to give $400,000 instead. Here is that film, which can be viewed here without the headset; push the view around with your mouse. For best results, increase the settings to the highest HD quality and expand to full screen view, or watch it through your VR headset. The U.N. seems to be the leader in charity industry monetization of VR. In collaboration with Here Be Dragons VR (formerly Vrse.works), the U.N. made a VR film entitled “Clouds Over Sidra” highlighting the plight of Syrian refugees. At the 2015 Humanitarian Pledging Conference for Syria held in Kuwait, they showed the film to donors. They expected donations to total $2.3 billion. Instead $3.8 billion was raised. Additionally, “Clouds Over Sidra” inspired one in six U.N. members of the public who viewed it to donate money, twice the average for the U.N. and UNICEF. Experience why. Here’s the video they watched. Push the view around with your mouse. For best results, increase the settings to the highest HD quality and expand to full screen view, or watch it through your VR headset. © 2016 by guest blogger Craig Arend, who has been a contributing photographer to the New York Times for 5 years. He produced Mirror to the Soul, an award winning Virtual Reality film for the fashion industry, featured in Vogue.com, Vogue.it, and Vogue.mx. This entry was posted in Exploring VR on October 10, 2016 by Terry Modica.